"That’s What’s the Trouble with John C."
As the Republican party’s first presidential nominee in 1856, John C. Frémont lost. In 1864 he challenged incumbent Republican President Abraham Lincoln as the presidential nominee of the Radical Democracy. The latter was formed by a group of radical Republicans who were dissatisfied with Lincoln’s slow pace on black civil rights (represented in this cartoon by the black doll). In this anti- Frémont cartoon, Miss Columbia wonders whether his candidacy is due to insanity. 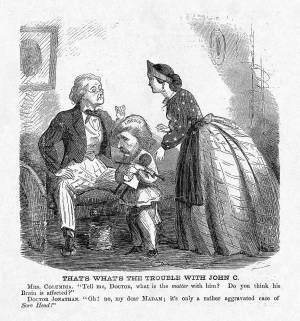 Brother Jonathan (a prototype of Uncle Sam) appears as a physician who reassuringly diagnoses it as due to resentment over Lincoln’s treatment of the former Union general. The president had rescinded Frémont’s 1861 emancipation order in Missouri and twice relieved him of his military command. It became common for the press to refer to dissident radical Republicans as “soreheads”. Frémont dropped out of the race in September..